Lose yourself in art, history and the world’s most famous maze! The Hampton Court Palace Maze is the UK's oldest surviving hedge maze. Commissioned around 1700 by William III, it covers a third of an acre and is known for confusing and intriguing visitors with its many twists, turns and dead ends. On average, it takes around 20 minutes to reach the centre. 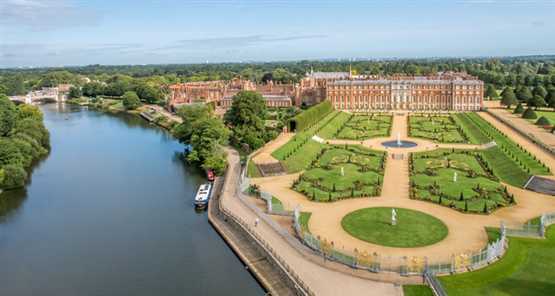 Hampton Court is also one of the most impressive royal residencies in England and it is hardly surprising that it was a favourite Palace of Henry VII when you consider the beauty of the building and its surrounding grounds. Discover Hampton Court Palace's past as it is brought to life through a series of events and exhibitions that provide an incredible insight into the inner workings of a Tudor household as well as the buildings Georgian influences. From 6-22 April, families will be able to venture back in time and join the hunt around the magnificent home and extensive gardens of Henry VIII. Following the guide of the Lindt Gold Bunny Hunt trail map, visitors will be able to follow the clues on the trail that will eventually lead them to the golden bunny statues hidden around the palace and gardens whilst discovering Hampton Court’s famous characters from the past. If they manage to solve the challenges, they will be rewarded with their delicious Lindt Gold Bunny chocolate. Hampton Court Palace and the Formal Gardens are closed 24, 25 and 26 December each year. All activities will be included in admission price. South West Trains run services direct from London Waterloo to Hampton Court. The journey only takes 35 minutes and the palace is a 200 metre walk across the bridge from the station. Visitors with sight or mobility concerns should be aware that cyclists often ride their bicycles on the pavement of the bridge. Trains also call at Vauxhall, Clapham Junction, Earlsfield, Wimbledon, Raynes Park, New Malden, Berrylands, Surbiton and Thames Ditton. On arrival at Hampton Court station there is a large step down to the platform from the train. Alternatively, take the train from London Waterloo to Kingston (there are four trains an hour and the quickest route is via Strawberry Hill or Shepperton) then the bus from Kingston to Hampton Court Palace. See below for bus route information. Bus routes: 111*, 216*, 411*, 461, R68, 267*, 513. From Heathrow Airport take the 111 bus. From Gatwick Airport, take a train from the airport station to Clapham Junction and change to the Hampton Court train. From City Airport, take the Docklands Light Railway to Canning Town and then the Jubilee Line to Waterloo. Catch the Hampton Court train from there. The palace is located on the A308 and is well signposted from all the major local roads; drivers should follow the brown tourist attraction road signs. From the M25 take either exit 10 on to the A307 or exit 12 on to the A308. The palace is also accessible via the A3 and then the A309. Limited parking is available at Hampton Court Palace (in the car park behind the Barrack Block) at a cost of £1.50 per hour and on Hampton Court Green (500 metres from the palace entrance) at £1.00 per hour. Parking is also available at the Hampton Court train station, 200 metres from the palace (please check at the station for prices). During the re-presentation and re-surfacing work at Trophy Gate, access to the palace car park will be via a different entrance. Please follow the diversion signs. The palace car park has nine disabled parking spaces for blue badge holders. They are available on a first come first served basis and are in the lower car park, near the entrance to the Welcome Centre. Parking is currently free for blue badge holders. Good value for money, saves time when queuing for the exchange ticket and when I became a member, my money was reimbursed! Amazing surroundings before entering the Hampton Court Palace Flower Show. Able to sit in beautiful grounds of the Palace and had our picnic on deckchairs. Show was very well organised and laid out. Plenty of toilet facilities, all kept clean. Great positioning of refreshment gazebos by the side of the water, on both sides. A very pleasant day out. One of the most beautiful places we've ever seen! The palace was absolutely spectacular! I have always wanted to go to Hampton Court Palace and I was not disappointed. I decided to take my 4year old grandaughter as a treat before she started big School. The staff were helpful from start to finish. The actors portraying historical figures from past really helped to bring the story alive. Every thing was emaculate and the gardens were beautifully manicured and maintained. Photography is my passion so I was delighted when I could take photos from every angle. The only unfortunate part was that we could not go round all the gardens as there had been a Good Food event prior to our coming, this was unfortunate as we had come all the way from Stamford in Lincolnshire for the day and making our way on several trains and the underground was quite an experience for a four year old who had not been on a train before, so to miss part of the gardens was disappointing. Other than that, it was a great day out and I would recommend a visit to a well organised National treasure. By booking on discount London, we saved about 4 pounds! It went off without a hitch and we had a wonderful time! I highly recommend checking out Hampton Court, as well as using discount London! Thanks! Perfect for families: The hunt is designed for children aged 3-12 years old and their families. Visitors should allow 1 hour 30 minutes to complete the trail with ease.